This event is part of NIRI WEST. 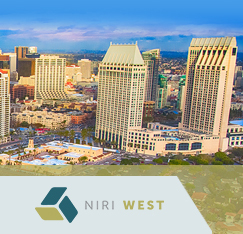 This comprehensive live seminar, held at the Westin Gaslamp Quarter, offers a broad, introductory overview of all aspects of investor relations, including marketing, communication, and finance. Come to San Diego to learn from seasoned pros, network with your peers, compare IR products and services at tabletop exhibits, and jumpstart your IR career. No prerequisites or advanced preparation required. The Fundamentals of Investor Relations course is designed around the 10 domains of the IR Competency Framework, corresponding to the main job functions of IR. The seminar's first day will provide the context for IR: company funding and capital markets, financial reporting, and regulatory and disclosure concepts. The second day will take you through a year in the life of an IR practitioner - including the quarterly earnings cycle and developing an IR plan - and provide practical tools for success in the role. Consider sending your support staff for their professional development or someone in an affliate role so they can learn more about the function. This is an excellent place to begin your career development in the field of investor relations. IRC® credential holders can earn up to 4 professional development units (PDUs) per day. IRC-credentialed volunteers and speakers may also earn PDUs. More information is available at www.niri.org/certification. CPAs may be eligible for CPE credit for completing the course (15 CPE credits recommended based on a 50-minute hour. Field of Study: Specialized Knowledge; Delivery Method: Group Live). More information is available at www.niri.org/CPE. View the seminar cancellation policy here. This comprehensive seminar is led by NIRI Fellows, Senior Roundtable members and select industry experts.